This week, we’re excited to bring you another podcast, featuring Mark Cave, Stephen M. Sloan, and Managing Editor Troy Reeves. Cave and Sloan are the editors of a recently published book, Listening on the Edge: Oral History in the Aftermath of Crisis, which includes stories of practicing oral history in traumatic situations from around the world. 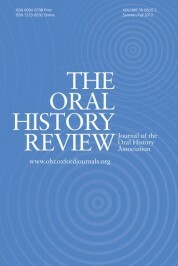 Here, they discuss the process of putting the book together, the healing potential of oral history, and the ways oral historians can take care of themselves when recording difficult interviews. Enjoy the interview, and send us your proposals if you’d like to share your work with the OHR blog. Image Credit: Refugees from DR Congo board a UNHCR truck in Rwanda. Photo by Graham Holliday. CC by NC 2.0 via Flickr. Mark Cave and Stephen M. Sloan are co-editors of Listening on the Edge: Oral History in the Aftermath of Crisis. Mark Cave is Curator of manuscripts and an oral historian at The Historic New Orleans Collection. Stephen M. Sloan is Assistant Professor of History and the Director of the Institute for Oral History at Baylor University. Troy Reeves is The Oral History Review’s Managing Editor. He also oversees the University of Wisconsin-Madison’s oral history program, which is housed in the UW-Madison Archives. In his spare time, he tries — quite unsuccessfully — to teach the OHR’s Social Media Coordinator about 1970s and 1980s Americana.